Multiple living areas, game room, high ceilings on all levels, and great views of the Continental Divide. High end kitchen with built-in breakfast nook. Easy access to cross country skiing, golf, hiking trails, and countless other recreational activities! This home is perfect for a large group or family to enjoy everything Keystone has to offer and more. 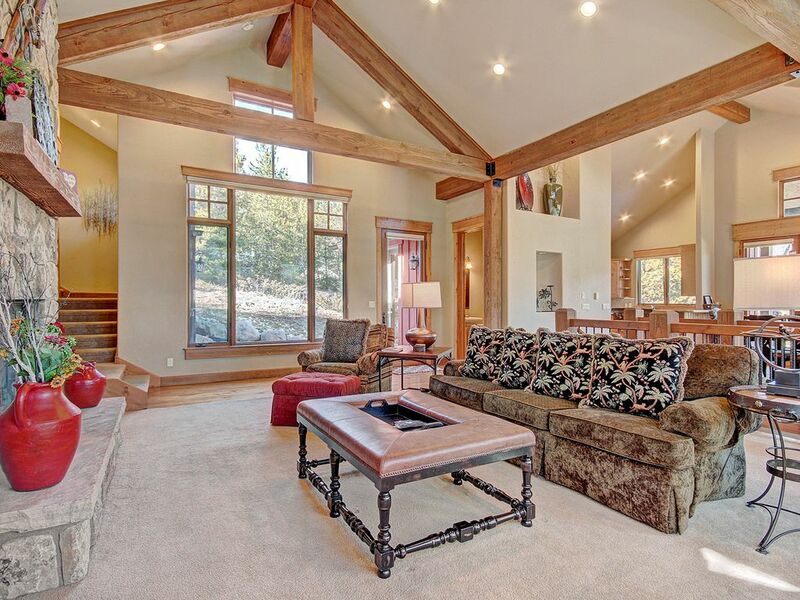 Only a short drive to the slopes, 170 Elk Circle provides seclusion along with convenience. The lower level of the home features a living room with a flatscreen TV that's perfect for a family movie night after a day on the slopes. There are two guest bedrooms on the lower level; one featuring two queen sized beds and the other featuring another queen sized bed with it's own kitchenette and small living area. There are two bathrooms on the lower level. The lower level also features a bunk room with a set of twin bunk beds. On the second level, you'll find the beautiful kitchen and two dining areas. The main dining table can seat up to 8 people while the second dining table can seat up to 5. There is also a breakfast bar which can seat up to 2 people for easy morning meals. There is also a laundry room with a washer and dryer for your convenience. The living room features a gas fireplace and a flat screen TV. Up the stairs you will find the master bedroom which features a King sized bed, ensuite bathroom, and sizeable closet. There is also a private patio off of this bedroom. On the top level of the home are the last two bedrooms, which both feature queen sized beds and their own ensuite bathrooms. Comfort-ability and convenience meet elegance in this beautiful single family home, relax in style here during your next family vacation. - This homey spacious home has several living areas and an abundance of sleeping space, so it's perfect for large groups or multiple families wanting a mountain retreat. - High end kitchen for the seasoned cook. - Easy access to cross country skiing, hiking trails, golf, and many more recreational activities. Our host was most accommodating and the home was very spacious with amazing views from every window. We enjoyed our stay so much we hated to leave! Great lay-out provided room for everyone to hang out together, yet plenty of private spaces to get away as well. The kitchen was probably the most well stocked kitchen we have seen and we have rented multiple properties in the past. We would definitely recommend this house to large groups and we hope to rent again next year. We have stayed at this home on several occasions the past few years. We love it here! It's perfect for several families to spread out and kid-friendly as well. In the summer there's a hammock to swing on while taking in the scenery, and in the winter there's a little hill to sled on next to the home. It's very clean and tastefully furnished. The Internet worked just fine on all our devices! Perfect Vacation, We Didn't Want to Leave ! We had an awesome family gathering for eleven in this home. It was perfect. It has five levels. The middle level is the living room, dining room, kitchen, laundry room, two balconies, and a patio. This area was great for the family gatherings and socializing. The other four levels include six bedrooms where family members can go for a little peace and quiet. The lower level also has a large entertainment area with comfortable couches and a large screen HDTV. During the football games we split up and watched two games in the two different areas while the girls socialized in the kitchen and on the balconies. It also has nice views of the forest and the golf course. Great location, close to all the activities in Keystone and Summit County. The WiFi worked great for us. My only recommendation is to ask in advance what to do with the garbage. We figured out that we probably needed to take it to a covered dumpster down the road. However, the dumpster was full so we didn't know what to do with it. We left a message with the rental company, but they didn’t call us back. We would highly recommend this home for your perfect family vacation. No Internet, no ping pong table as indicated. Called management company numerous times to complain of no Internet service, and asked where router was to reboot. No response..... Finally, rec'd call back next day and was told she would come out to find router. Never showed ... Had to go get linens all the time, not enough. Beautiful home. Very sorry about the service you received while a guest of ours. The home had just been remodeled prior to your arrival. We were under the assumption that the ping pong table remained in the home, in the garage. This has been noted for future guests. As far as our representative not showing up to the home, we have addressed the situation, so that when we tell our guests we will be there, we will. We normally provide 3 complete sets of towels in every Bathroom, due to your response we will provide more, along with additional sheets in the closets. We are happy to hear you enjoyed the stay and hope you would return to this home, as you have experienced this is an amazing home very close to Keystone and Lake Dillon. DEPOSIT: Major Credit Cards Accepted - 1/3 of rental required upon confirmation of all reservations as down payment (min $300). Remainder due 30 days prior to arrival. PRICING: The rates above do not include 6.28% CO and local sales taxes, a 5.9% resort booking fee, and a $59 accidental damage waiver which will all be added to your reservation. Rates DO include clean linens and towels when you arrive and include a cleaning after you leave. You are responsible for cleaning during your stay. A mid-week clean is available for an extra charge during your stay. Until reservation is confirmed, rates are subject to change without notice.